But during the boom years of the 1920s, the cloud-piercing Penobscot, Guardian, and Buhl skyscrapers on Griswold dwarfed the Ford. However, the Ford, cloaked in white terra cotta and Italian marble, is standing tall again. At a splashy party in November, well-wishers gathered to toast the building on its 100th anniversary. But it may not have reached the century mark if it weren’t for Grosse Pointe Shores resident Tom Paglia Jr., who bought the building in 1991 at an auction for the bargain-basement price of $1.35 million. He was the only bidder. Paglia also attributes the building’s longevity to the fact that he’s an on-site owner. “I’m not an out-of-state insurance company or partnership or investor. I care about this building, and it’s my livelihood,” he says. The structure has a diverse roster of tenants, including mortgage brokers, CPAs, restaurants, and insurance and real-estate firms. But two-thirds of tenants are in the legal profession, Paglia says. 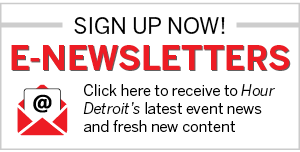 Several venerable judges and lawyers have leased offices in the Ford, including former Michigan Supreme Court Chief Justice Dorothy Comstock Riley and famed defense attorney Clarence Darrow, who had an office on the 17th floor in 1925 during the murder trial of Ossian Sweet, a black doctor who fired on a menacing white mob outside his east-side Detroit home. 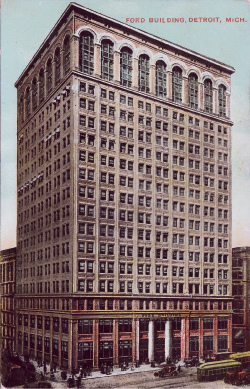 Burnham, famous for designing New York’s Flatiron Building and many structures in Chicago, was responsible for three other Detroit buildings: the Majestic (1896, now razed), the Dime (1912), and the David Whitney, completed in 1915, three years after the architect’s death. Paglia seems poised to usher the Ford into its second century. “I love the people in this building, and I love downtown,” he says.